The Buffalo Beauts may not be residing in the NWHL standings where they were initially forecasted to be, but after their decisive Dec. 30, 2018 4-0 win over the Minnesota Whitecaps they may be on the verge of reaching new heights. 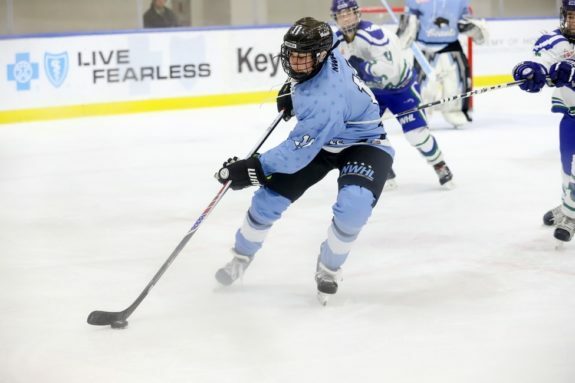 If the Beauts are to achieve what most surmised they would from the get-go – essentially an Isobel Cup or bust – they will do so at least in part to the steadying presence of veteran defender Lisa Chesson. With seven regular season games to go in the 2018-19 season, Buffalo currently stands with a record of 5-4. No matter what their record may look like, there has been an underlying value in their most seasoned blueliner that has permeated throughout the team. A value that tends to fly under the radar. Let’s face it – league-wide there is a tendency to overlook how reliable Chesson truly is when considering the Beauts roster on the whole. She was in fact named a 2018 NWHL All-Star, but even that nomination might not do her the proper justice. Too often in her previous seasons she fell into the category of “if she is doing her job well, then you are not noticing her”. This season more than ever though, Chesson is making things happen offensively and it is opening eyes in the process. Coincidentally, her defensive game has not missed a beat. There are only eight Beauts on the current roster who were members of their 2016-17 Isobel Cup-winning, underdog squad. Just six of those players have played each season as Beauts since, as forward Emily Janiga played one year in the CWHL and defender Emily Pfalzer was centralized with the USA Women’s National Team before returning to Buffalo. Both players would not be part of the Beauts’ 2017-18 campaign. Of the six who have remained on through, it is Chesson who arguably brings the most unique type of importance to the current lineup. Even after the team’s 4-0 defeat of Minnesota she spoke with the media in a subtly confident way that further proved there is more than meets the eye of a 5-4 record. NEWS: Lisa Chesson is returning for her third season in #BeautsBlue! The prior games against the Whitecaps were indeed close, as Minnesota won all three earlier meetings this season by one tally in each instance. Chesson and teammates may have narrowly lost the series, but they were the ones to boldly stamp the exclamation point at the end. Casual followers of the Beauts likely known that the team’s roster is comprised from a sizable chunk of Olympic talent. Team USA gold medalists from the 2018 PyeongChang Winter Games like Pfalzer, forward Dani Cameranesi, and goaltender Nicole Hensley were signed to the team during the 2018 summer. Shannon Szabados – a three-time Olympian for Canada – may be the most widely recognized of all of Buffalo’s Olympic stars. As great as those players all are, do not overlook the fact that Chesson is an Olympian too. Representing the United States at the 2010 Vancouver Games, she helped her country earn a silver medal. Chesson played in all five contests for the Americans at those Games, and was a point-per-game player with two goals and three assists. Olympic experience has long been widely regarded in the women’s game as a pinnacle for achievement. Chesson’s own experience with the USA Women’s National Team when she was just 24 years old has unquestionably contributed to her maturity as a player nearly a decade later. Lisa Chesson’s veteran guidance among the Buffalo Beauts defense corps is invaluable (Photo Credit: Pat McCarthy). At 32 years of age, Chesson is the eldest among all skaters on the Beauts and she is only 12 days younger than Szabados, who is the oldest player on the team. These are the only two players on the Beauts over the age of 30. Most often Chesson finds herself paired with a standout rookie defender for Buffalo, Savannah Harmon, who at 23 years is one of the youngest players on the roster. Having a veteran like Chesson alongside her is not only reassuring but an opportunity for tutelage, although Chesson herself borders on being self-deprecating. Chesson’s ability to blend both offense and defense in her game is unsurmounted and widely underrated. Having played in each of Buffalo’s first nine games this season she has already set career highs in assists with five and points with six. Chesson’s plus-six trails only Blake Bolden’s plus-seven for best plus/minus rating among Beauts defenders. Through her three NWHL seasons all with the Beauts, Chesson has played 30 regular games thus far. In that stretch she has totaled two goals and 12 assists for 14 career points. With a definite intention of producing more offense from the defense corps this season, and with those aforementioned seven more games to go, look for her to increase upon those single-season highs of assists and points, and to set a new mark for her goal totals. With talented defenders like Harmon and Bolden around her, Chesson and company have made the conscious strategy of putting up numbers throughout the 2018-19 season. What Will Come Next for Buffalo? The Beauts sit at third place in the NWHL standings with 10 points through their first nine games. That trails both the Minnesota Whitecaps’ 14 points with a record of 7-3 and the Boston Pride’s 12 points at 6-2. Though they do have some ground to gain, being able to rely upon a savvy veteran like Chesson means that there is one less thing that newcomer head coach Cody McCormick needs to be concerned with. "I love everything about playing in Buffalo. "@NathanielAOlivr sat down with @BuffaloBeauts veteran defender Lisa Chesson ahead of the Beauts' home opener against the @CTWhale_NWHL on Saturday at 1:30 p.m.
No matter what your profession might be, your mind is put at ease when you can count on individual who already knows the lay of the land and is responsible in the process. Chesson is that type of individual. Now with more time to analyze and plan for his team, the Beauts may be able to string some victories together in a row and put some distance between them and the .500 mark. Make no mistake that Chesson will be instrumental in that process and will remain as “Miss Steady” for Buffalo.